There are few myths one comes across regarding career since the beginning of one’s educational life. You are provided with many advice and it only leaves you more stressed. Such myths will cause you to feel demotivated and have less self confidence. The misconceptions prevail even if you have been working more than a week or years. Believing and pondering over such myths will only make you limit your sense of thinking and innovating, damage few relationships and feel less self assured. 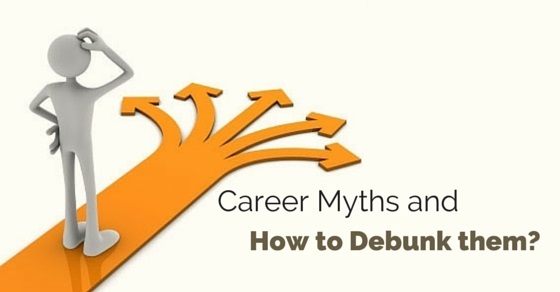 To beat the erroneous beliefs and have a satisfying and successful work life and career, here are few common career myths demystified. Having a diploma in higher studies of a stream that will further enhance skills and knowledge on the path of career you choose. Realities:The myth that a college graduation degree would get you into dream jobs and offers are in reality a fabrication. Earlier there used to be very few college graduates. With the increase in the number of graduates in today’s world it becomes difficult to reach the dream job right away. It has become less certain now that the college diploma will land you to the finest professional career. Many people believe that once you are appointed in a job you will only incline and reach promotions with a package of success and failures. Realities: Once you have been fixed and selected it will take time for promotions or in other words promotions may not appear even in the 10th year of work. You may have to change jobs which are even more risky plan. Choosing different career paths after realizing your inner most strength are some possibilities. Some times to reach a degree of success people also choose career transitions. Learning a great amount of deal of one stream, becoming professional may get you to a job that requires a particular expertise. Realities: However when you actually get down to work you need to excel in more than one proficiency. You will have to face challenges which will require you to focus on different skills. The most last job that you involve in before your retirement will be significantly distant from the first job you work on. You will have to rediscover yourself many times in your career. It is a common belief that the career path you dream of and choose to pursue will bring you joy. Realities: Perhaps it is true. But career is a part of life and unhappiness too. May be it is the boss or the coworkers and associates you are not happy about. Or the fact that you have yet not been offered promotion even after years of sacrifice, or the many times you have been overlooked for credits and incentives. Satisfaction is seldom found. Some believe that on approval in the perfect job would find happiness in their career. Realities: Every job consists of a certain level of sacrifice and forfeit. One is obligated to compromise in some job to reach specified goals. Thus in the bargain you will have to cooperate and negotiate with the job to reach your aim in the career. There are no such perfect jobs that can grant an individual satisfaction he can swamp in. The employer’s are responsible to hand over tasks and provide with options with which you can grow in your career. Realities: You have to seek challenges and opportunities to outshine other employees. It is you who will have to pick up risks and start dealing with your career yourself. The employer’s will not be concerned for each employee’s career but the total productivity and company’s yields. Thus taking charge of tasks to grow in your career is essential. It is believed by most that career is to be planned when one is young or at the time of failure can change paths whilst he is young. Realities: Career planning is constant and enduring process. Even after a certain age one may discover one’s passion towards an industry and may change paths. It will all depend on the skills and talents one has. One can only choose the right career when the efficiency and proficiency in oneself is identified well. Self introspection at early age may help; however discovering yourself is for lifetime. The work place politics amongst coworkers, associates and bosses are common and bad for the career. Realities: The fact is all the successful entrepreneurs are politicians. Here by politics we refer to the ability to comprehend social patterns at workplace, to identify and generate coalition and the quality to understand when to support certain associates and when to stand back. Productive league will maximize the inadequate resources which involves the practice of politics. The feature belongs to great professional and business persons. Belief that extroverts are more effective speakers, take situations into charge and are best at self execution. Realities: The belief about extroverts is facts however introvert leaders have proved to be a powerful fit. They are poised and thoughtful. They are comfortable to speak to and have calming senses. Thus they are consistent and their capacity should not be underestimated. A person is born a leader or otherwise is not having leadership qualities. Realities: Nobody inherits leadership qualities from their parents or is born with such. Leadership is a skill and not an attribute. Some may beat others with their leadership but the application of the set of skills required can be learned by anyone. Communication, communicating effectively to motivate and influence others, deal with conflicts and solving problems are some of the skills by which leadership can be practiced to the maximum. Being courteous, respectful, polite, and considerate are valued qualities in a career. Realities: It is good, however not as good to meet certain aims. High productivity demands certain civil attributes but they even enjoy frankness. Sometimes the conversations or discussions are needed to be honest, forthright, blunt and outspoken. Thus high performance also needs these traits along with civility. Group work focuses on the target with a collective contribution to the productivity. Realities: Group work brings a lot of tedious tasks along. It doesn’t seem as marvelous then. Certain expenses like group meets cannot be invisible. Groups only prove fruitful if they have right members with accurate focus and effective meetings. However such qualities are seldom found. A person who is professionally and functionally specialist in a particular industry can be an effective leader of the budding associates. Realities: Someone who is a great professional for example an engineer who is best at his work does not indicate that they will prove to be great leaders of engineers. The skills of leadership are totally different from the skills of a profession. Thus for leadership one must have or learn the set of skills to become a great leader. It applies to any career and not just engineers. Belief which states, talent will overpower all the difficulties in the career. Realities: The career doesn’t merely survive over talents. The workplace demands you to cooperate and build a certain kind of chemistry with the fellow workers. No matter how much talent you own it will prove useless if you are an inconsiderate and reckless person you will be the worst in your career. Talent alone doesn’t bring dream career with it. Realities:This is a common belief that to raise the creativity of work, hiring a creative brilliant person will do the thing. The basic principle of work creativity is that each person in a team requires a certain amount of adequate creativity and most of the time people work below that level. Fear of appraisal and blunders holds them back. Experimentation should be applied and risks should be taken to actually meet the level of creativity for a work. Everyone is so busy each day that it becomes hard to see the illogicality of few of our common myths and assumptions. There are other ambiguous ideas and suspicions which leads to workplace weakness, back-stabbing, disagreement and even dishonesty. It’s one’s choice to cut loose and be open to the probability of an outstanding career. To balance personal and professional life one must understand not to believe in myths and experience reality with a fresh and clear mind.